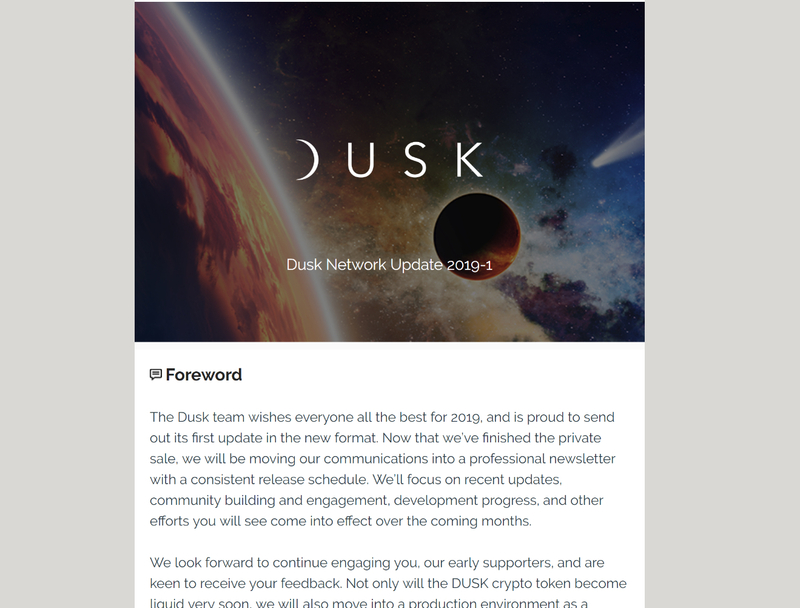 Dusk Network is a cryptographically transparent digital ledger. 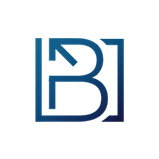 A high-throughput and scalable permissionless blockchain that provides confidential proofs of ownership, compliance and funds. It satisfies global privacy requirements yet enables audits by the public ánd the regulator. Issuing digital securities is a long process with costly intermediaries, and uncertainty of outcome. Dusk streamlines this process and automates trading compliance with the world’s first programmable confidential security contract. With Dusk, buyers and sellers of digital securities can frictionlessly issue and compliantly trade. Privacy is a force of good. It is demanded by investors and regulators alike. Dusk features a privacy-oriented, programmable framework. 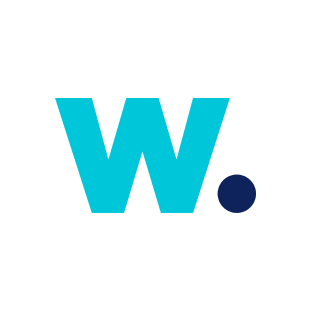 This framework is used by issuers of digital securities to represent the conditions of their shareholders agreement, statutes, and applicable legislation. We call this novel framework ‘XSC’, short for ‘Confidential Security Contract’. XSCs run on a distributed ledger called the Dusk Network, which is immutable and guarantees business continuity. Bad actors abuse and manipulate markets, and collude with others to achieve this. To ensure these bad actors are powerless Dusk uses revolutionary privacy technology which ensures trade secrecy and compliance with data privacy laws such as GDPR. Blockchain technology is about trust and resilience. 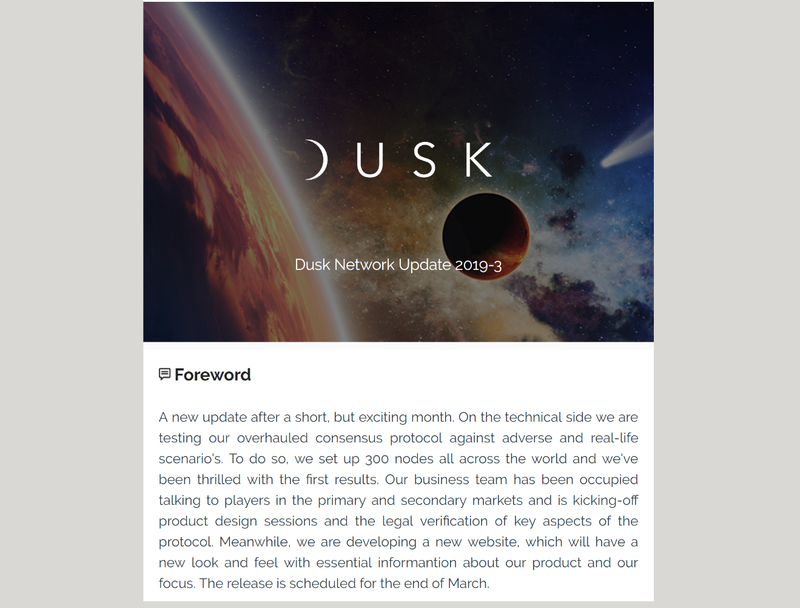 Dusk Network is the world’s first blockchain for regulated markets. Through Confidential Security Contracts (XSC) businesses and investors share a real-time share registry that also features reports and analytics. Data in a blockchain is securely stored all over the world. Before transactions are recorded forever and sent for storage, they are first validated by a consensus algorithm. The Dusk Network does all that, whilst being bulletproof in emergency scenarios. Digital securities require a frictionless and special-purpose distributed ledger. Dusk is designed to prevent unwanted forks, uncertain transaction finality and power centralization. Dusk Network grants actors the means to satisfy global privacy requirements such as GDPR and trade secrecy requirements, whilst preventing market manipulation. Ongoing compliance with KYC, AML, and CTF directives is imperative. Comprehensive governance frameworks are an integral part of the protocol. 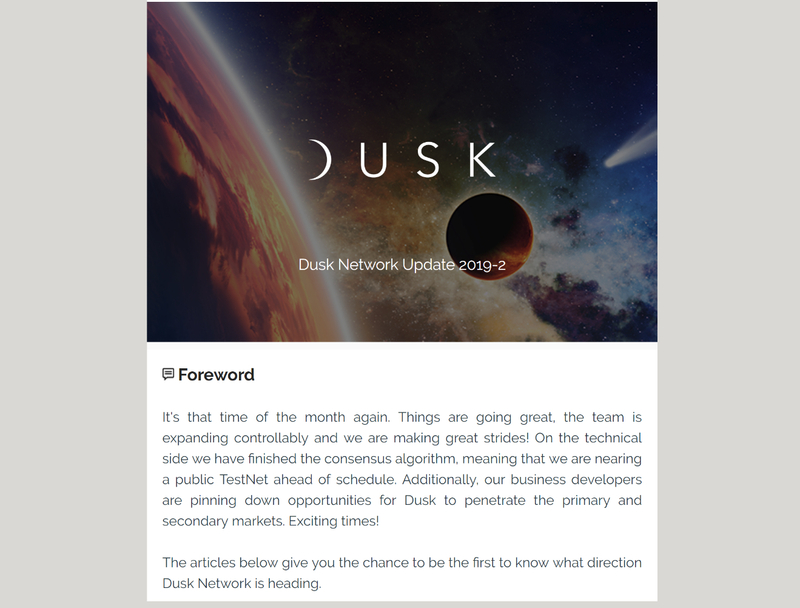 Dusk Network offers equal access. Anyone can issue, register, and trade digital securities. Providing an alternative to expensive central intermediaries. The financial services industry exists to serve our constant desire to innovate and grow the world around us. Technological advancements are at the forefront. Providing affordable, easy, access to this growth, for companies and investors alike, will prove crucial to continuous global success.